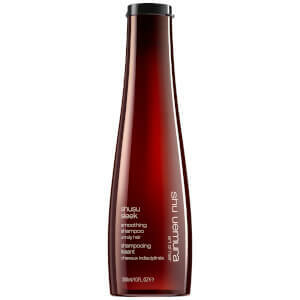 Wash hair with Shu Uemura Art Of Hair Shusu Sleek Shampoo (300ml) to tackle unruly hair. Enriched with Black Cumin Oil, the shampoo helps to nurture the hair fibre, delivering frizz control and volume reduction with a satin shine. Aqua / Water, Sodium Laureth Sulfate, Coco-Betaine, Glycerin, Sodium Chloride, Hexylene Glycol, Polyquaternium-10, Cocamide Mipa, Sodium Benzoate, Peg-60 Hydrogenated Castor Oil, Salicylic Acid, Phyllostachys Edulis Water / Phyllostachys, Edulis Shoot Water, Hexyl Cinnamal, Alcohol, Caramel, Linalool, Nigella Sativa / Nigella Sativa Seed Oil, Safflower Glucoside, Coumarin, Methyl Cocoate, Sodium Cocoate, Gentiana Lutea Extract / Gentiana Lutea, Root Extract, Sodium Hydroxide, Ci 14700 / Red 4, Citric Acid, Parfum / Fragrance.